On June 30, 2016, incoming President Rodrigo "Duterte Harry" Duterte will be sworn in as the 16th president of the Republic of the Philippines, replacing former President Benigno Aquino III, who will step down after serving for six years of his term; leaving a legacy of reviving the country's anemic economic growth into what's considered by economic pundits as one of the fastest growing economies in Asia, if not the world. Latest data showed the Philippines have notched a 6.9% in GDP, against China's only 6.7% last year. And many foreign investors have set their eyes on pouring in their investments into the country, even as the newly-elected President Duterte's announcement recently that he wouldn't allow factories to be set up in the National Capital Region, otherwise known as Metro Manila, anymore. Understandably, the newly-elected leader has expressed concern that Metro Manila is bursting at the seams. With more than 13 million residents, illegal squatting in Metro Manila has become a big headache for the government for many decades now. And perhaps, the only way to decongest the urban areas is to decentralize the industries. In fact, United Nations data indicated that the Philippines has more than 70 percent of population living below the poverty line with many of them living in high risk areas along the river estuaries. These are the same group of people who were tired of the politicians' false promises to uplift them from the quagmire of poverty. Hence, when the best opportunity comes knocking at Duterte's doors, he didn't lose any time to give it a deep ponder, if only to help alleviate the lives of the socially impoverished majority. As Prof. Prospero de Vera, a political analyst from the University of the Philippines, was quoted by a newswires agency as saying that Duterte's victory was "phenomenal rise to the presidency which upends traditional wisdom that only candidates from Luzon or the Visayas can win the presidency." In short, Duterte's victory was breaking the spell of the "Mindanao curse", which for many years have only elected presidents from Luzon and the Visayas. De Vera pointed out that Duterte's phenomenal victory was the consequence of many Filipinos' frustrations over the administration's failure to deliver what majority of the destitute Filipinos had expected. He is convinced that "something dramatic must happen in Mindanao", considering that he is the first leader from Mindanao who was elected into the highest office. On the contrary, Prof. Edmund Tayao, also a political analyst, believed that Duterte's victory couldn't be compared to the same base of supporters when President Benigno Aquino III won the presidency in 2010, saying that Aquino won by plurality in that election year, too. Political observers believed that it wasn't an easy decision for Duterte who was adopted by the PDP-Laban party prior to joining the presidential contest. In fact, it took a last-ditch attempt for his supporters to nudge him into considering running for president in a country that is rocked by rampant graft and corruption, trading of illegal drugs, and other crimes. 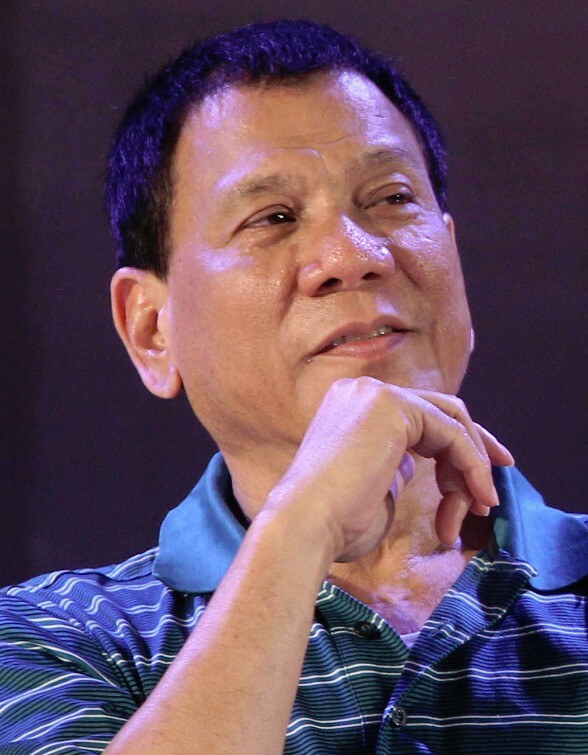 While the other presidential timbers have already started their campaign sorties, strategizing on what's best to attract huge followers without really shedding so much money to earn their trust comes election day, incoming President Rodrigo "Duterte Harry" Duterte, 71, has yet to make up his mind as to whether to catch up with the rest of the pack or not. And who would think that an erstwhile prosecutor who became a tough mayor of Davao City, the largest city in the world in terms of land area, for 22 years before he finally decided to battle it out with the bigwigs in politics. Notorious for his firebrand attitude and belting out of incendiary foul language during the campaign sorties, Duterte has earned the respect of a wide margin of support from the masses who were tired of the government's elitist approach to solving social problems in the country of 103 million people. As Mr. Perry Diaz, a columnist from Pinas tabloid based in Los Angeles, Duterte, who has zero tolerance against criminals, is a combination of Donald Trump, Vladimir Putin, Lee Kuan Yew, Ramon Magsaysay, and "Dirty Harry", all wrapped into one. But farfetched from the minds of those who thought that he'd be vindictive, Duterte immediately thought to clear the path to reconciliation to the losing parties for the sake of national healing and to foster unity among the people. Even prior to his oath-taking rites, President Duterte has already presented his administration's eight-point economic agenda which include tax reforms, accelerating infrastructure spending, attracting foreign investments, agricultural development, creating more jobs, and expanding the implementation of the Conditional Cash Transfer (CCT) and maintain the current macroeconomic policies, the Philippines News Agency (PNA) said. PNA added that the new administration is set to introduce changes in tax revenue collection efforts of the Bureau of Internal Revenue (BIR) and the Bureau of Customs (BoC). Likewise, infrastructure-spending will be accelerated in order to address major bottlenecks in the Public Private Partnership (PPP), wherein 5 percent of the GDP will be allocated for this program as a means to create more jobs. The incoming administration will also attract foreign investments by addressing restrictive economic provisions in the country's Constitution. On top of these, the incoming leadership has a blueprint of platforms on how he will fulfill his plans within six months of his presidency. Duterte's spokesman Mr. Peter Lavina said the incoming administration will pursue a 24/7 fight on criminality, illegal drugs, and corruption in government. Duterte also called on Congress to enact a law that will clear the pathways to amending the 1987 Constitution, which will take a shift from presidential to federal parliamentary form, and allow foreigners to own lands, utilities, educational institutions, and the explorations of natural resources in the country.